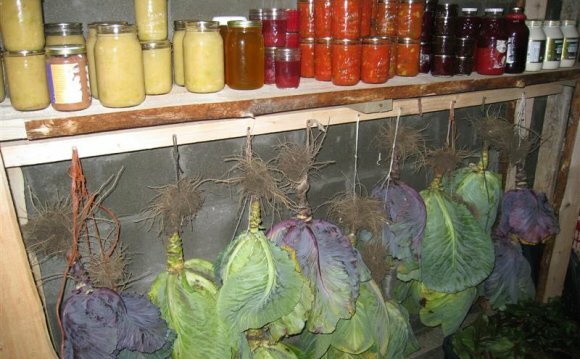 The great thing about cabbage, carrots and all the other crops, as David Cavagnaro and Nancy Bubel describe in the two previous articles, is all you need to store them for months is a cold, well-ventilated space. A spare refrigerator works pretty well, but even better and more spacious is a real root cellar. A basement root cellar is convenient and useful. Traditionally, this cold room was an underground space built under or near the home, insulated by the ground and vented so cold air could flow in and warm air out in the fall. Then when winter temperatures arrived, the vents were closed, and the cellar stayed cold but not freezing. Most modern basements are too warm for long-term winter storage, but you can create an indoor version of the cellars that have long served homesteaders well by walling off a basement corner and adding the vents, as shown in the drawing above. The two vents create a siphon effect that lets you regulate the flow of cold outside air into the insulated cellar room, allowing the temperature to remain near freezing through the winter months. Fred Matlack of Vera Cruz, Pa., developed this nifty design, and the basement root cellar he built in his basement has worked just as he planned. “You just need to watch the temperature to be sure you close the vents before the temperature drops below freezing, which would damage some crops, ” Matlack says. Several universal truths remain constant that will help you create an optimal root cellar, even though every basement situation is unique. The first is location. Because you’ll need access to the outdoors for fresh air, choose a cellar position that includes a window. It’s possible to bore holes through a basement wall for the 3- or 4-inch vent pipes you’ll need to install, but it’s a whole lot easier to simply remove the glass from a window, replace it with plywood and then run your pipes through holes in the wood. In cold regions, you can create an insulated panel to replace window glass. Laminating a layer of half-inch-thick exterior-grade plywood on each side of a piece of 1- or 2-inch-thick extruded polystyrene foam is a terrific way to make an insulated panel for vent pipe access. Polyurethane construction adhesive is perfect for holding the foam-and-wood sandwich together. When it comes to any basement root cellar, the exterior walls create ideal interior temperatures. This is what delivers the cooling action, and the more masonry surface you’ve got, the better. That’s why you’ll want to choose a corner location for your installation if you can. This offers maximum exposure to exterior walls while minimizing the need to build and insulate interior walls. And if you’ve got a choice, select a spot with the highest soil height outside. Does one of your possible options include northern exposure? Terrific! That’s great if you can get it.